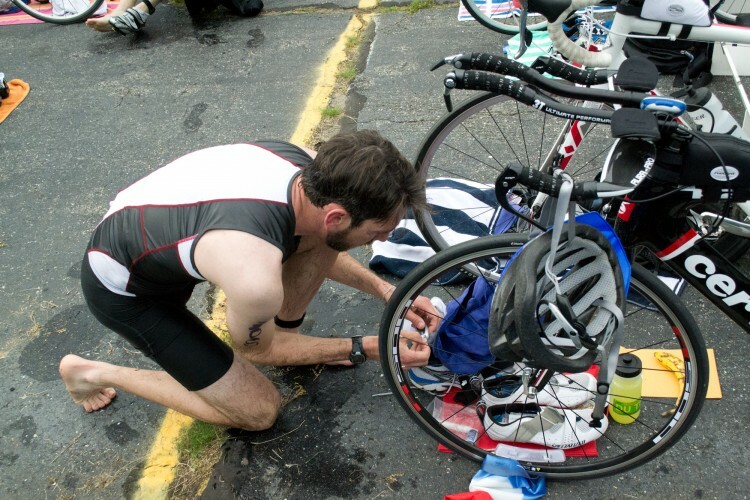 Long-time readers will know that last year around this time I did my first triathlon. I had been training for months, and I was extremely nervous about the open-water swim portion, which almost turned me off the sport before I even finished. But in the end, it was so much fun, and I’ve been looking forward to doing more of them since last summer. This morning I competed in the same race, the NE Season Opener in Hopkinton. What a difference a year makes! Last year I did the 1/4-ish mile of swimming, 10 miles of cycling, and 5K of running in 1:16:34, good enough for 171st of 366. This year: 1:08:57, or 131/438. 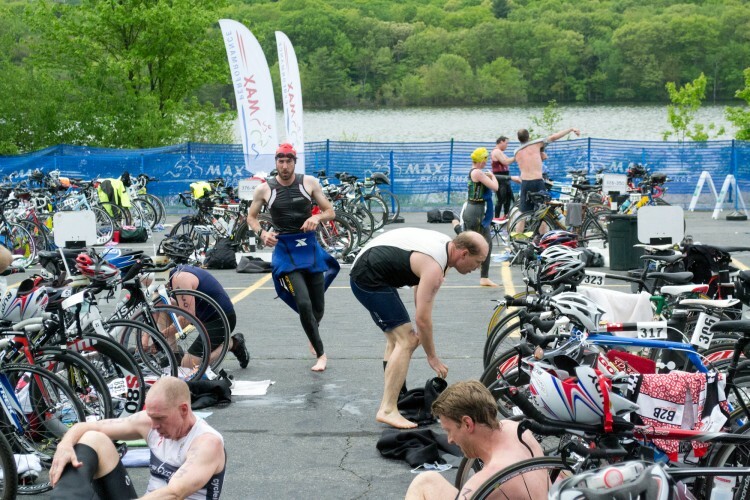 As a “newbie” registrant in 2011, we had our own special start time and apologized for bumping into each other during the craziness that was my first open-water swim. This year, in the biggest starting wave, it was all fists and kicks for the first 30 seconds until we got ourselves sorted out. (Next time: start farther out.) I found some feet to draft off through the 58ºF water, did a great job sighting with my optically-corrected goggles, and was surprised at how fast it was over. In fact, it wasn’t until I was about halfway through that I realized my form kinda sucked and that I needed to remember what I usually do in the pool. “Ah right! Less flailing more pulling.” Still, I was almost three minutes faster this year. Ah, the bike! 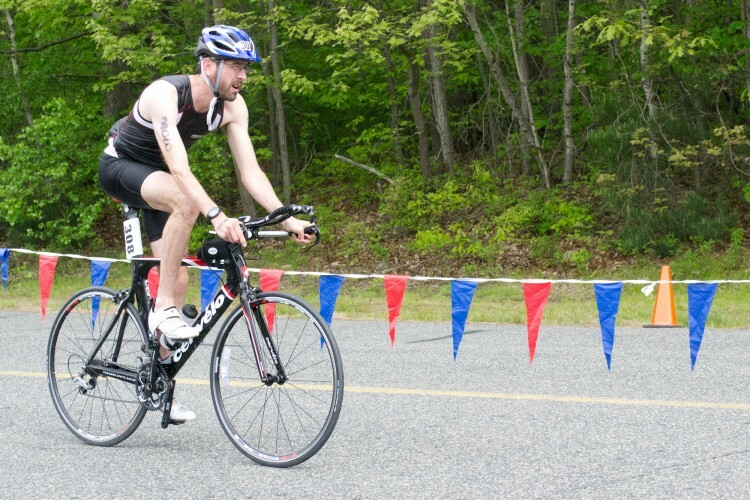 After a relatively fast transition, I hopped on Speed Junkie (my Cervélo P2) for my first race on it. I must confess that I was nervous in the days leading up to the race. How would I do around other people? Would I be able to spend most of the time in the aero position? Would I be as fast on the bike as I had hoped, or would it be an expensive ride? Could I hold on over the bumpy roads? Would I have trouble with the tight turns? Would I crash? Etc. Etc. Etc. Let’s remember that last year during my two triathlons as a newbie, I did all of the passing on the bike (and almost all of it during the run, too). I wasn’t expecting that this year, since I was starting among faster people, and there were fewer people starting ahead of me. I’m sure I would pass people, and I’m sure others would return the favor. Turns out, I’m fast on a bike. And the roads were very well controlled. There was very little traffic, and I was able to ride where I wanted on the road. I spent 85-90% of the ride in aero, worked hard, and only got passed by a half-dozen people, including one woman from BU with longer hair than anyone I’d ever seen on a bike and two of my Landry’s teammates. (That reminds me: must get a Landry’s tri-top so that I can represent . . . unless/until TT1 wants me to wear their colors.) I caught one of the Landry guys when an ambulance was attending to him along the side of the road near a rather rough patch of road. Poor guy. All things considered, I did very well over the whole course. Small, wiry guys like me do well on hills, and I’m getting better at riding this little bike over open ground. (Almost 5 mph better.) I like passing people. Finally, the run. I was feeling good today, but I was trying to be smart. I’ve had some IT band pain recently—which I’m watching closely—and over the last few days my right arch started getting cranky, too. Stretching, ice, the foam-roller on my hip and thigh, and self-massage for my foot should (hopefully) do the trick. I’m happy that this coming week is an easy one in my training plan. So I decided to run hard but hold back a little, try to hold a good pace throughout the whole run, and not feel (too) bad about being passed. It was what it was, which was consistent but just okay . . . the only part of the event (including transitions) that was slower than last year, actually. Strangely, I’m okay with this. I had enough at the end for a nice finishing sprint. My diabetes strategy most certainly did not work out well. Not well at all. In fact, I’m mystified by how bad it was. Diabetes is what it is, but I was hoping for something better. In a perfect world, I would eat some breakfast before leaving the house, take some insulin for it, adjust my insulin before the start, and then take nutrition during the event (almost) like I didn’t have diabetes. Unfortunately, I don’t know how much insulin to take before a triathlon—because Insulin + water = scary—so I don’t really eat much, except a Greek yoghurt right beforehand. I don’t even usually need to eat before I swim at 5:45 in the morning, but when starting at 9:15, it seems completely different. It was also different than my normal multi-hour rides and long runs. Perhaps it was the adrenaline from the anticipation of the event. Perhaps there’s something going on with my basal rate. Perhaps it was just sun spots. Who knows? What I do know is that I need to make it better. And I will. At any rate, I had to take about a half-unit of insulin before the swim, and I didn’t come down much when I was in the water. Or during the ride. Or the run. Fortunately, I didn’t have much of that high BG pain in my legs that I sometimes get, but I could tell that I was high throughout the run. Next time will be better, I hope. So, all things considered, it was a major confidence booster with some great experiences and a few obvious things to improve. Onward! Oh, and Lisa took a bunch of amazing pictures. 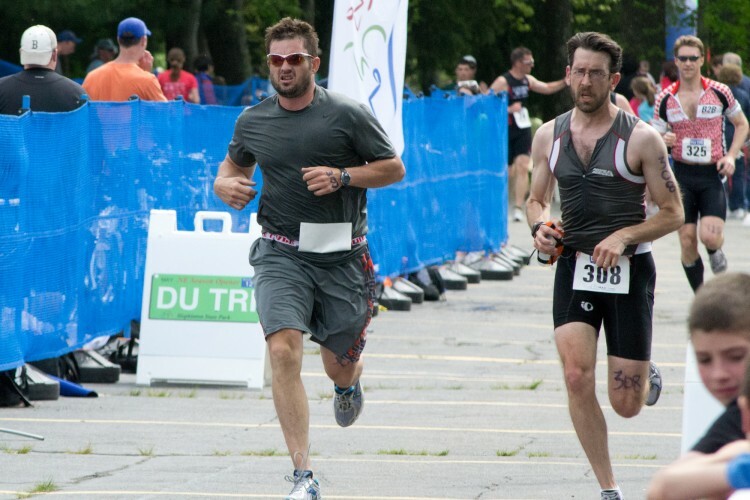 This entry was posted in Cycling, Diabetes, I am Rembrandt, Photography, Reluctant Triathlete, Running, Swimming. Bookmark the permalink. Lisa should be a sports photographer. And you make the best faces. I learned a ton just reading your race report (as usual). Congrats on killing your time from last year, on not crashing Speed Junkie and on knowing your body enough to recognize when to push and when to ease off. Sorry about the bad BGs but that’s a learning curve too. You’ll get there mon ami. Congrats on the AMAZING improvement! That’s terrific. The best cure I’ve found for this is to race A LOT so that you’re less keyed up. Of course, that’s easier when you’re just a runner and there are cheap races going on every week.